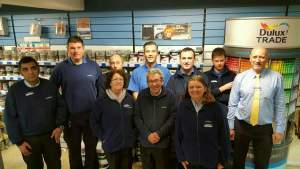 The Romford store has been here for around 30 years and our 10 team members have more than 180 years’ paint and decorating supply experience between them. Our manager has over 40 years in the business alone! We aim to keep all customers thoroughly satisfied, so as well as the wide variety of paint and wallpaper products and brands, colour-matching and mixing, a quick chat means we can source any other decorating products that you might need. We also offer protective coatings expertise, so you’ll find more specialist paints and treatments here too. We offer site visits to tradespeople, plus you can book an in-store consultation for kitchen and general interior design insights. There’s dedicated parking right outside for trade and retail customers. Collier Row Road is just off Whalebone Lane North, a few minutes’ drive from the A12/Eastern Avenue West. We’re about 150 yards from The City Pavilion, next to Sungate Café. 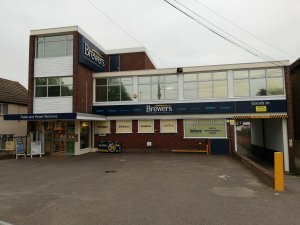 For all our latest deals and top tips, follow us on Twitter at www.twitter.com/BrewersRomford. From the direction of Chase Cross along the B174, take the first exit at the roundabout onto Collier Row Road, you will find the store on your left. Travelling from Whalebone Lane Northtowards Romford centre, take the first exit at the roundabout onto Collier Road Row, the store will be on your right.